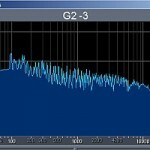 Tags: Audio mixing EQ tips, Guitar recording and mixing techniques. 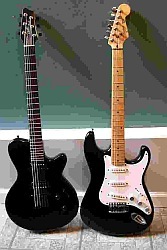 One of the key elements in rock mix is thick and heavy guitar sound. One of the effective ways to accomplish this sound in the mixing process is through a technique called as “Double Tracking”. In this post I will illustrate how to double track guitars in the mix with the objective of making it heavy and thick. Also in the last section of this article, you will also know the general guidelines on mixing guitar tracks in your home studio that utilizes different techniques depending on how the guitar is recorded. Also with this type of recording technique, you do not need to record the guitar twice. Record with the best distortion tone you need. Do not record it yet if you are not yet convinced of the distortion tone; much better to experiment with a live band before starting to record the guitar. The overall purpose is to have a clean and final recording ready for mixing. Remember it is not advisable to fix the distortion tone in the mix; it makes the mixing process to be complicated. c.) If you only have one microphone, you can still follow the above steps except that you will only be creating one track in your DAW. It will be double tracked in the mix (to be illustrated later) by manual duplication of tracks. d.) If you do not have a microphone, you can implement this technique on recording the clean guitar using DI method(direct to your audio interface) as one track. It will be duplicated in the mix later. 2.) Double check the tuning of the guitars. Very easy to do but often overlooked. If you are only recording one guitar track (using one microphone or DI), start with Step1 until the end. If you are recording guitars using two microphones (thus you have two recorded tracks in your DAW) start with Step3. Step1.) Start with placing the 1st track in Track1 of the mixing session. This is the original guitar recording. Step2.) Create Track2 of in your DAW mixing session. Simply copy and paste the wav file in Track1 to Track2. Step3.) Pan the Track1 to -75 units (left). Depending on your DAW/mixing software, this could be in %, for example if the maximum left pan setting is 100% so it will be 75/100 or 75%. 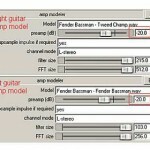 You can read this detailed article on panning guitars in mix. Step5.) Now to get that wide thick sound, you can apply 5ms delay to one of the guitar (either left or right) (mix 100%). This delay may not be necessary if you are recording guitars using two microphones because there is a natural delay captured between these microphones. However feel free to experiment with the sound. Step6.) To even make it heavier, do not anymore apply reverb on any of the tracks (it is highly important that the reverb is from the room and amp based reverb that will be realized during the recording process). 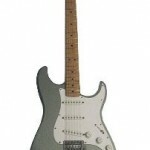 It is because if you start applying reverb on the guitar, it will tend to sound weak and far. Since you are mixing for rock, it is important to get the “in your face” guitar sound. a.) Cut 1000Hz and 800 Hz at Q=1.4(start with -3dB then gradually increase until you get the desired sound) on any guitar to make sound so clean and avoid the cracking sound. 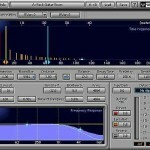 For more EQ tips, you can read the next section of this tutorial. b.) Cut 3000Hz with around -6dB and Q of 1.0 for both guitar tracks. This will improve the vocal clarity in the mix. Optionally for heavy rock and alternative music, you can start with -3dB to still get that strong mid-range guitar overdrive tone. Step8.) Adjust track1 and track2 volume and stop when it is loud enough for the guitar tracks to be heard, not dominating the vocals. It is highly important to rely on your ears to decide whether the settings are working or not.